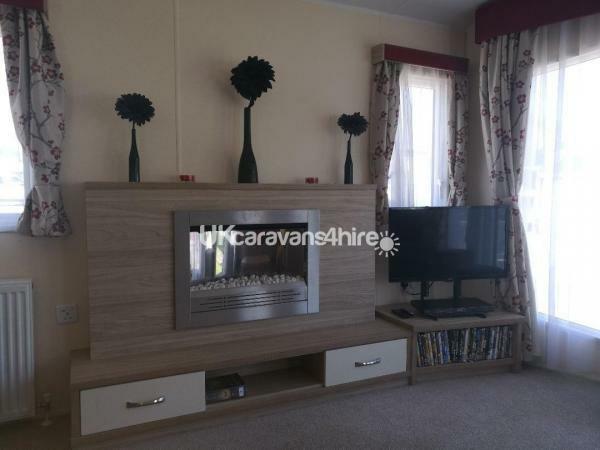 The living room, kitchen and dining table are all on a large open planned area, equipped with a TV with DVD player (selections of films, from PG to +18), swap books shelves (take any books you want home and donate your unwanted ones), gas fire to keep cosy. 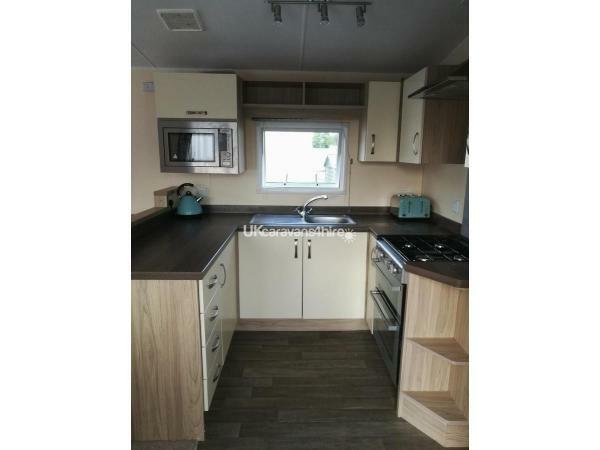 The fully fitted kitchen comes with fridge/freezer, gas cooker, microwave, toaster, kettle and various baking and cooking equipment. 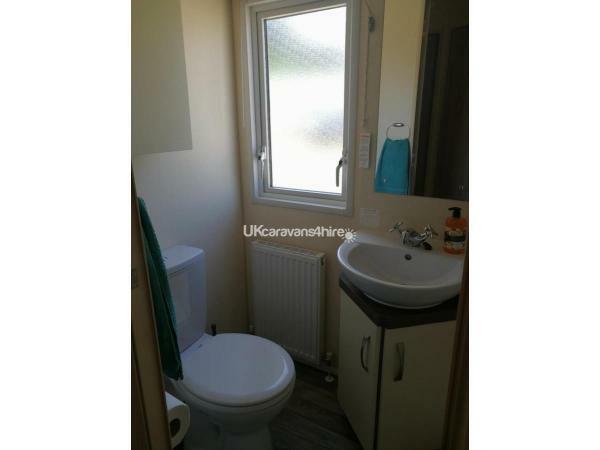 Three bedrooms at the back: main bedroom - has a double bed, a double wardrobe and plenty of storage. 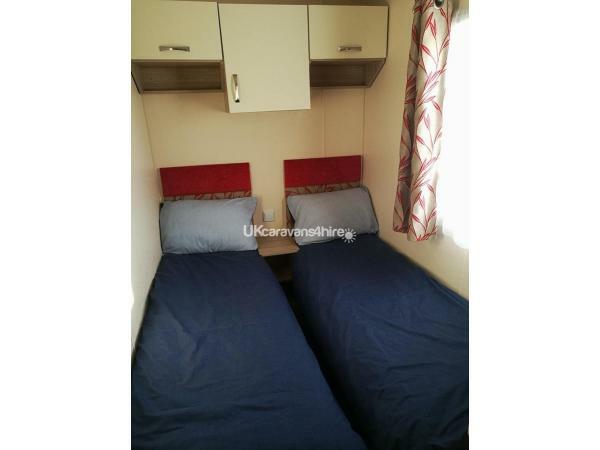 The other two bedrooms - have two single beds in each with single wardrobes. We provide all bedding. 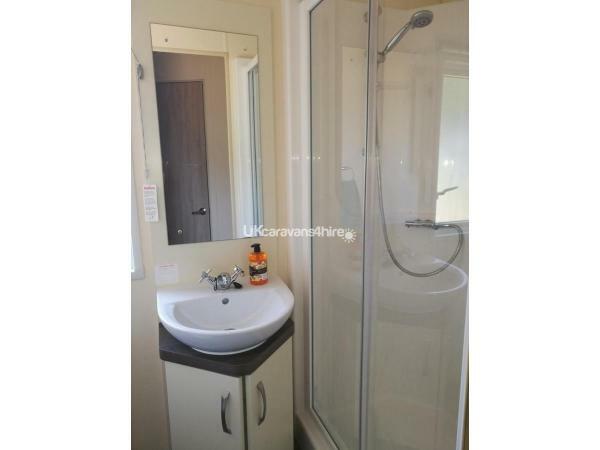 The bathroom consists of a shower cubicle, sink and toilet. Please bring your own towels. 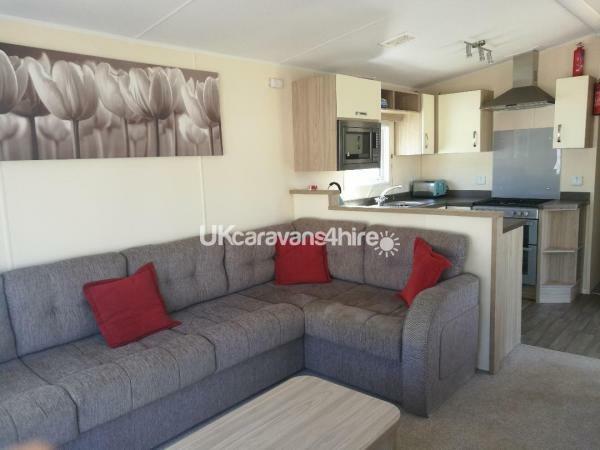 The caravan comes with double glazing and gas central heating so even on a chilly day, you can be cosy inside. There is a parking bay for one car. 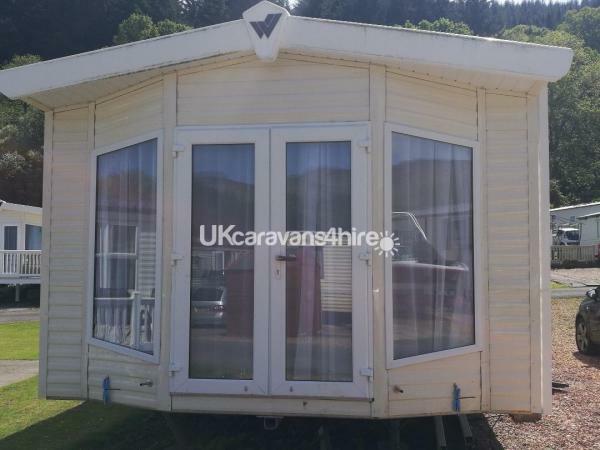 This family friendly caravan park also has a shop, laundry, children's play area, bar and restaurant. This is a no smoking caravan and we will accept a pet. There will be an extra charge of £10 per stay for your pet. 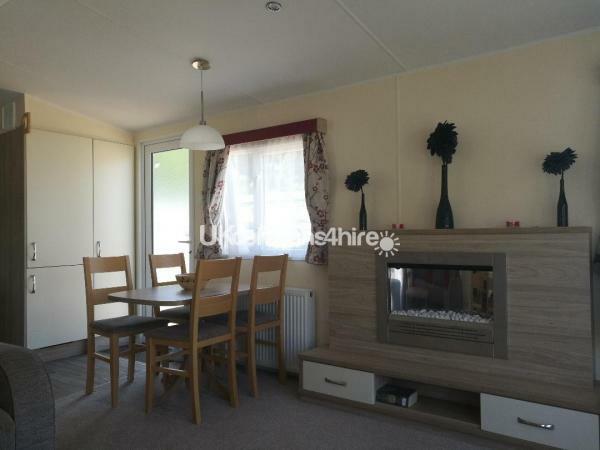 ​The rent is £65 per night and we have a 3 night minimum stay . 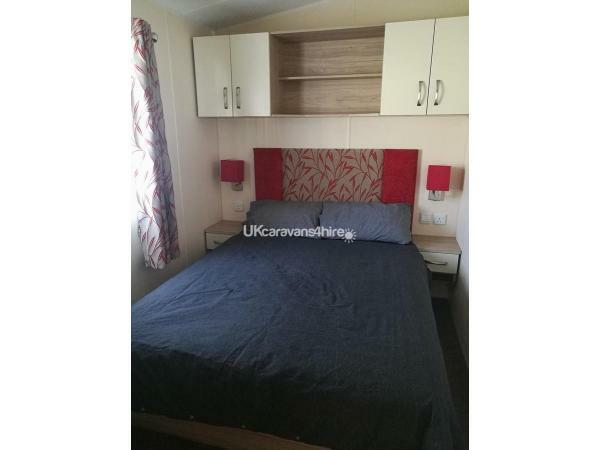 Booking is secured with a non refundable £100 deposit, with the balance due 4 weeks before your visit. If your booking is less than 4 weeks away from your visit, the full payment is required to secure your booking. An additional £150 breakage deposit will be added to your balance and will be refunded within 7 days after your departure. Had an enjoyable stay at this park. Plenty to see and do outdoors and small pub onsite which does good food. Plenty of water sports available at a local centre not to far to walk from the site, there is also a small brewery and tourist information place on other side of the loch not to far to walk. Accommodation is new and enough space for everybody, kitchen is well stocked also dvd,s for you to watch. Limited mobile phone service on site for certain providers and internet is not best which makes you go out and explore, certainly not a bad thing in my opinion. Lovely 4 night break. 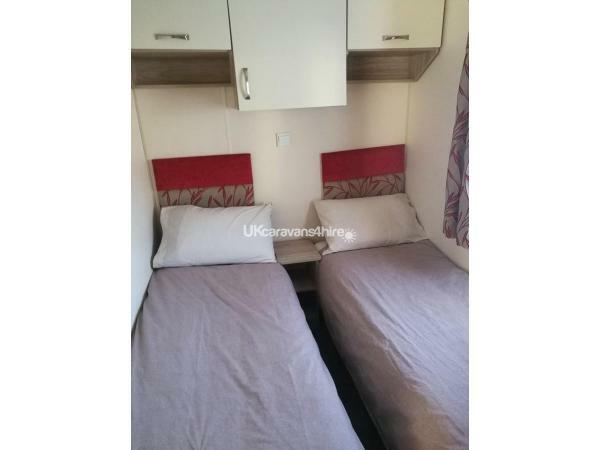 Caravan is very clean and only small issue we had was no tv aerial (but DVD player). Some would say you don’t need it on a relaxing break but when you have 4 kids and there’s a few rainy days, it does help. There is a good selection of DVDs. We used the restaurant one night which served good food. Prices reasonable in the shop. Loch Earn water sports is a 10 minute walk away and great fun. 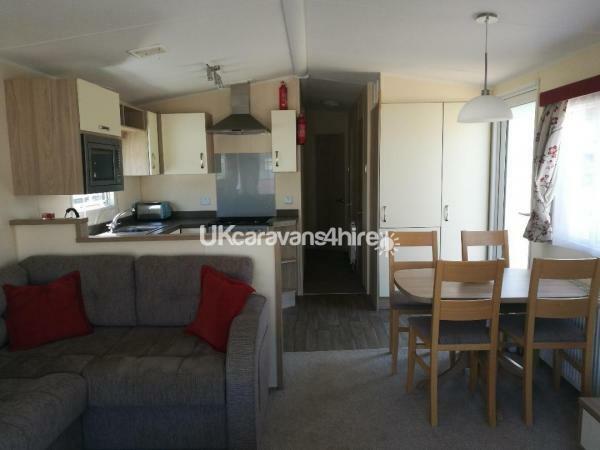 Very clean comfortable caravan with all necessary utensils and a choice of books and dvds. Friendly site with helpful staff in a beautiful lochside setting.